Update on two cute little fluffy bottoms! 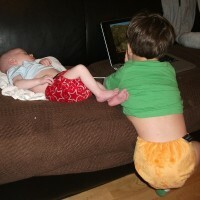 I said in my recent essential kit list post that I would write an update on how we’re finding covering two little bottoms with the cloth nappies that I added to our stash just before Joel was born. I thought I’d go through each type of nappy we have in turn, and describe the advantages and disadvantages that I’ve found of each one. I also say which of my boys wears each type – Joel is a long and slim baby, currently about 11.5 lbs at 3 months, with skinny thighs and a small waist; Andrew is a slightly taller and heavier than the average just-turned-2 year old with quite muscly thighs and bottom. I use different types of nappy depending on where we are – at home I have more time and space for nappy changes, which always involve nappy free time and potty time, whereas when we’re out I need to do them more quickly and efficiently before Andrew climbs off the changing table (and it’s only a matter of time before Joel rolls) or they fountain all over the mat and their clothes; so I’ve included where I use each type of nappy – one-part ones when we’re out and two-part ones when we’re at home (two-part ones are fine to take off quickly when out, just not so quick to put on). 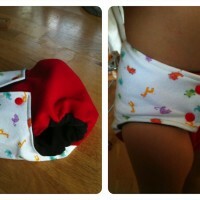 A two-part nappy; the fitted absorbent layer has poppers to fasten it, as does the waterproof outer wrap. 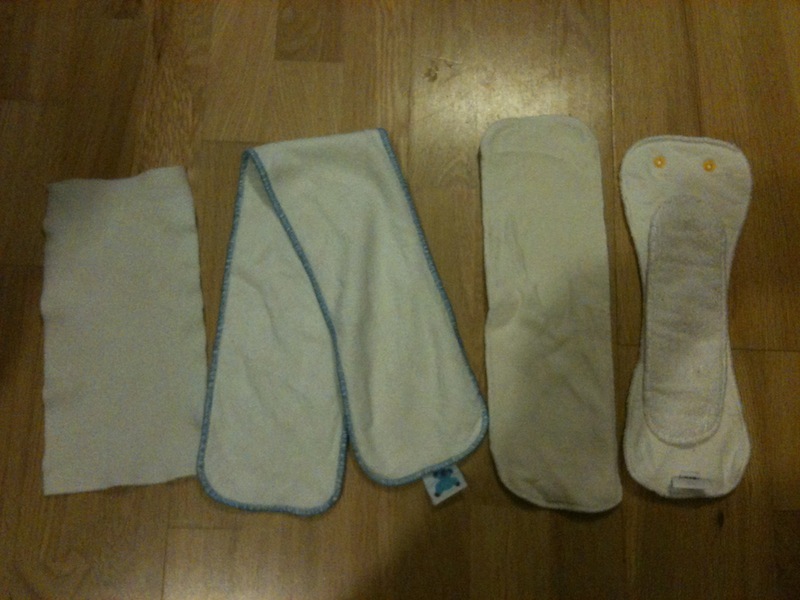 Outer waterproof layer with pocket inside where you stuff absorbent inserts (which come with the nappy when bought new) – I stuff when I take them off the airer so they’re ready to put on in one piece; fastens with poppers. 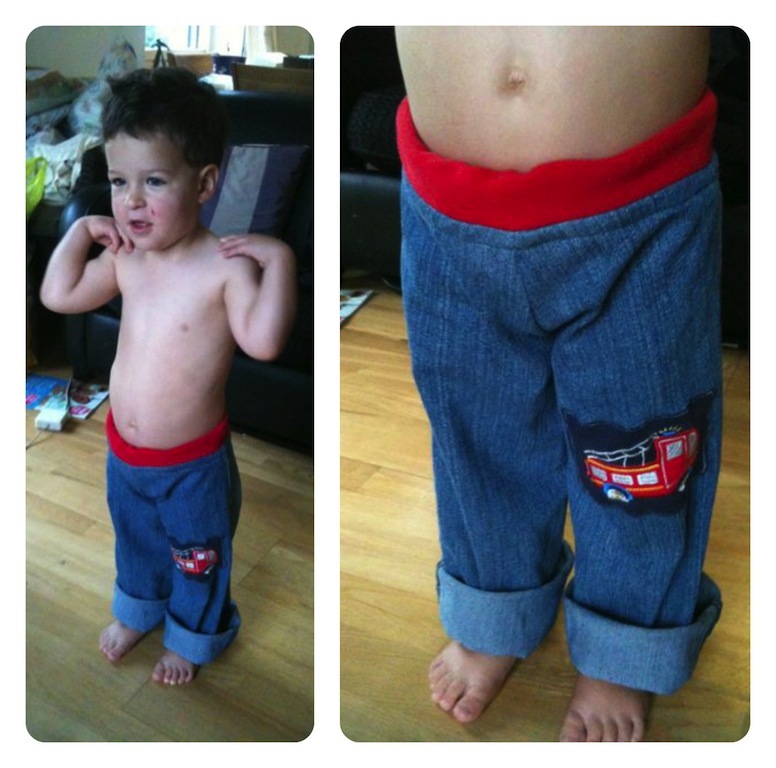 Joel in a prefold plus Blueberry one-size coverall wrap with 'Dino' print. It looks quite bulky here, but I think it does when it first goes on but soon squishes as it gets wet and less stiff. It's hard to get a photo of him staying still, hence the blur, unless he's asleep, which is how I took the other photos of him on this page! A two-part nappy; the absorbent layer is a rectangle of cloth folded into three, which sits within a fitted waterproof wrap – we have different sorts of wrap, some sized (i.e. newborn, small, medium, large) with velcro fastening (Bambino Mio), some one-size from birth to potty, adjusted and fastened with poppers (Rumparooz, Blueberry). 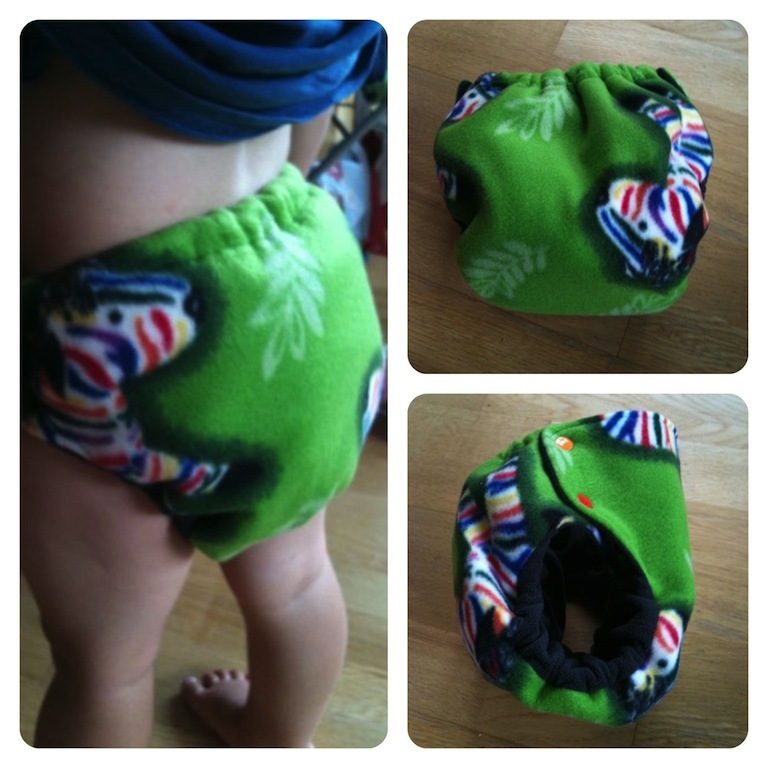 A sized ‘all-in-two’ nappy; the waterproof outer is covered in soft minky fabric and has a popper fastening, and absorbent inserts snap in with poppers to the outer – I snap them in when I take them off the airer so they’re ready to put on in one piece. large newborn poos not so well contained (though small ones are fine) – a good fit around slim thighs but the super trim style means not so much space for poo to fill up and squeeze out! All these nappies last about 12 hours for both boys, who are both heavy wetters; we get occasional leaks, but these are always due to wicking – when the wet bit of the nappy comes into contact with clothing because we haven’t put it on quite right (it’s a bit of an art to perfect!) or the pyjamas have moved a lot – all-in-one sleep-suits are much better than two-piece pyjamas we find. 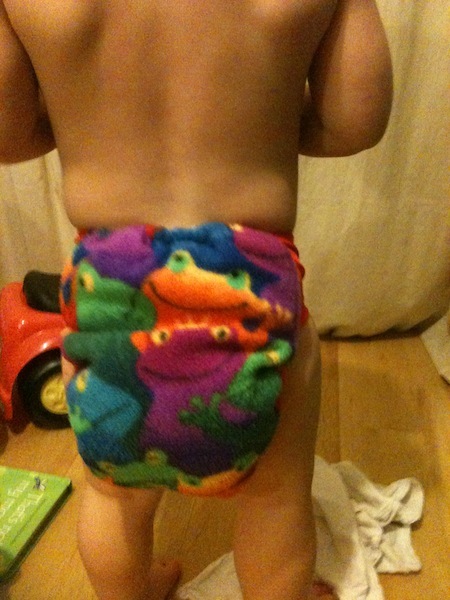 itti bitti boo nappy: A two-part nappy; the fitted absorbent layer has poppers to fasten it, and has extra absorbent layers that snap in with poppers too, plus we put a Motherease waterproof outer wrap on. 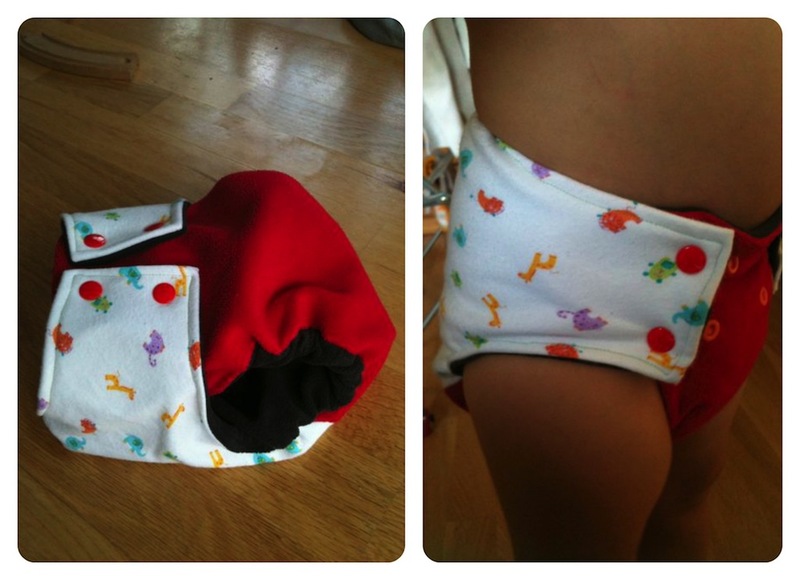 A pocket nappy; large pocket with waterproof coating where you stuff very absorbent inserts (they don’t come with the nappy), and stretchy lycra tabs with poppers to do the nappy up. There are two sorts: the standard yo-yo is wider and covered in fleece fabric with various colourful prints; the slinki yo-yo is trimmer and covered in lycra-style fabric in a bright plain colour. bulky fit on standard yo-yos – ‘weebles wobble but they don’t fall down’ springs to mind….! Motherease one-size fitted nappies and Nature Babies classic (medium) wrap: This is the same nappy that we use in the day for Andrew, but with extra boostage at night for Joel, and I prefer our Nature Babies wrap rather than the Motherease airflow ones because it fits around Joel’s thighs better and the leg gussets prevent wicking better. All these boosters can be used in most nappies interchangeably (except only the itti bitti boosters fit their nappies because of their super trim fit), but I’ve noted below in which nappies we tend to use each one to get the right absorbency for what we need in the day or at night. Generally, the more absorbent the insert, the longer it takes to dry (which makes sense). Other features: has poppers to snap it onto the inserts in the itti bitti snap in ones and boo. Author RuthPosted on 31/01/2013 25/05/2013 Categories mum-hood, nappynessTags cloth diapers, cloth nappies, diapers, fitted nappies, nappies, one-size nappies, pocket nappies, pre-fold nappies, reusable diapers, reusable nappies, sized nappies, washable diapers, washable nappies, wrapLeave a comment on Update on two cute little fluffy bottoms! 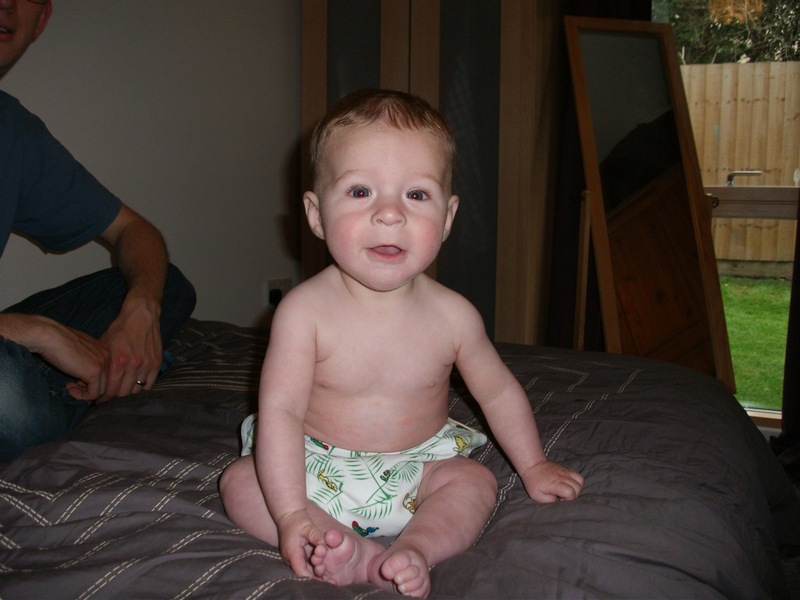 This post started out as a supposedly brief mention in my pregnancy diary post for last week, as I spent a lot of time last week finally making decisions on nappies so that we will have enough to dress a new little bum as well as Andrew’s ever growing toddler bum! But I soon realised that I had a lot more to say than a brief mention would allow. I decided instead to devote a whole post to recording my decisions, partly to spare Tom more of my wittering on about cloth nappies when he gets home from work – if I’ve had an outlet on the blog, then hopefully I’m less likely to bombard him with tales of fluff; its also partly so I have something tangible (apart from the nappies themselves of course) to show for all my hours spent researching last week – I’m a researcher by training, and a good researcher always writes up what they find so others can benefit ;). I thought the post would appeal to some of my readers who might be thinking about using cloth nappies either now or in the future. 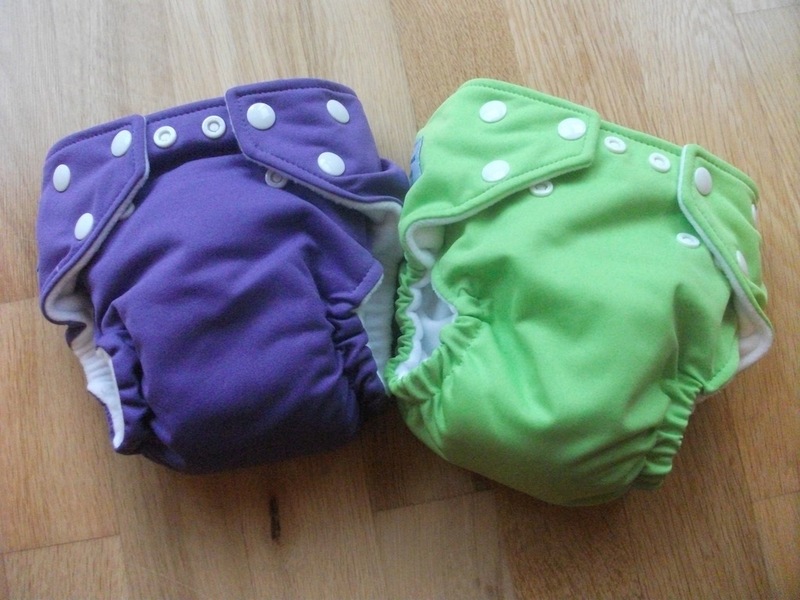 As the world of cloth nappies has its own lingo I’ve tried to do some jargon busting along the way in this post; I know I’ve found it hard to figure out the various bits of terminology as I’ve been reading reviews and forums online. You may have noticed that I already used the word ‘fluff’ above – that’s a general term used by cloth nappy enthusiasts to mean cloth nappies. 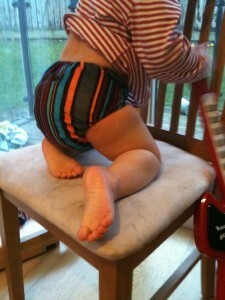 Let me give a (quick-ish) summary of our cloth nappy experience to date (I wrote about it a while ago too). Before Andrew was born, I’d heard about modern cloth nappies, and how they were different from the terry squares that Tom and I had been decked out in as children of the early 80s. We decided to do a bit of research and figure out whether we wanted to use them with our new baby. Tom, being Tom, did the maths and worked out that financially it was definitely worth using cloth, as the energy and water we’d use as well as the initial out-lay for the nappies (which handily we ended up being given anyway) would still work out cheaper than disposables (we call them ‘dispies’, though I’ve also seen ‘sposies’ in cloth nappy quarters) in the long run, especially as we were planning on having more than one child. We had heard it said that using cloth isn’t quite as ‘green’ compared to disposables as many people think, because of the extra energy involved in washing, but we came to the conclusion that you’re comparing apples and pears: all that landfill versus more energy consumption – they are completely different environmental issues. The eco dispies, which are more expensive than ordinary ones, seemed like another good option. But we also thought about how we shop – as we live so near the supermarket, we rarely use the car for shopping (or at all for that matter) but instead do it mostly on foot or bike, a little each day, whereas if we used dispies, we’d have to use the car to carry home the big packs as well as our usual groceries, or shop online and consume the fuel of the delivery van not our car. In the end we decided that personal financial reasons were higher on our priority list than trying to figure out the environmental impact of the various options, which at the end of the day is impossible for us to do on a personal scale. So which design did we go for initially? When we’d decided that we would give cloth a go, my parents kindly gave us a set of 16 ‘pre-loved’ (read: secondhand, but it sounds so much nicer when you’re talking about nappies!) 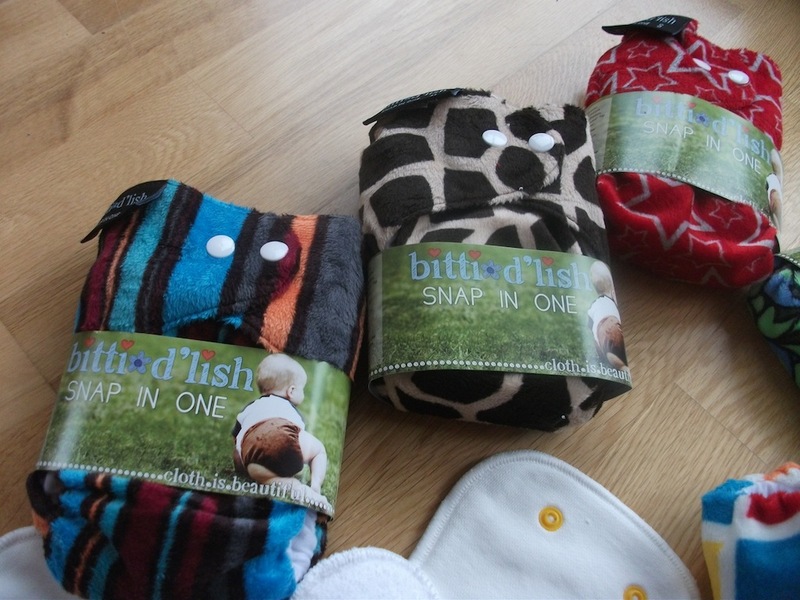 Mothereaseone-size fitted nappies and 5 of each size of waterproof outer wrap (small, medium, large) to last from ‘birth to potty’ (often abbreviated to BTP). 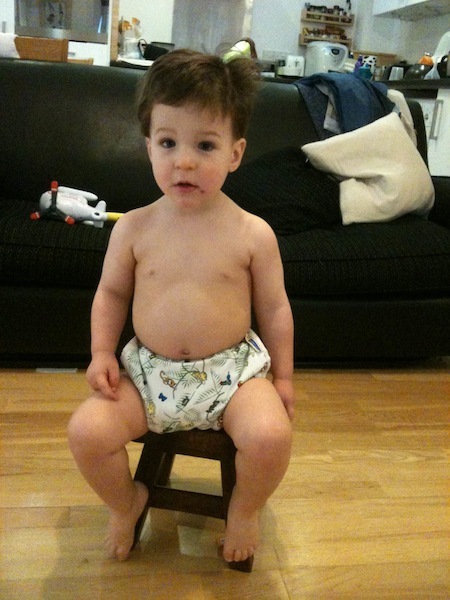 The main nappy, which is made of towelling material, is shaped like a dispy nappy, has poppers that do up easily without the need for pins, and is separate from the waterproof wrap that poppers on afterwards. These have fitted Andrew well, right from when he was about 6 weeks old to now, and we’ve had just the right amount if we wash them every 2 to 3 days. We have added some more boosters to our ‘stash’ (collection of cloth nappies) as Andrew has started to become a heavier wetter in toddlerhood than when he was as a baby, but otherwise our stash is currently what it was at the start. I should say here that until now we haven’t used cloth nappies at night, because we thought that they wouldn’t be absorbent enough and didn’t want to risk leaks being the reason why he would wake up, especially when he was little and would wake up in the night for feeds anyway. But recently Andrew has started to out-wee the dispies that he should be in for his weight, and not all brands even do a bigger size than what he’s in. This had led to much laundry of bedding as he’s woken up soaking in the morning. So I thought we had nothing to lose now in trying cloth at night (which real cloth nappy addicts say is perfectly doable and in fact better than dispies), because leaking doesn’t seem to wake him up and I’d rather wash a few more nappies a week than bedding every day! The other thing to mention in explaining my decisions on stash expansion is that Andrew has in the past month or so started showing interest in the potty. We haven’t had any dirty nappies in a while, as it’s all gone in the potty, though his daytime nappies are still generally fairly wet and his night-time ones very wet. Increase the number of daytime nappies we have, as we currently only have enough for one bum, though with more frequent washing it could probably stretch to 1.5 bums – that still falls short of 2, and I don’t want to clear up the consequences of not having that half a bum covered! Get some cloth nappies for use at night time with both bums. For the first task, I had various options in mind – either get more for Andrew (and baby wears the Motherease), or get more for baby (and Andrew wears the Motherease), or get a few more for both Andrew and baby (and they both wear the Motherease – that’s the great thing about a one-size, it fits baby and toddler). In the end I went for the third option, as I’ll explain soon. If you know me well, you may be wondering why I’m doing this with less than 2 weeks before due date – surely I could have sorted this out sooner than a time when baby could arrive any day. Well I had done some research on nappies back in June, and had decided to try some itti bitti boos for Andrew, which had come recommended as a very absorbent (or ‘thisrty’) but also slim-fitting (not bulky) nappy; this sounded perfect for Andrew who was then wetting very heavily in the day, before the potty captured his interest. This was supposed to be the first step in trying something new, with the view to Andrew having these and baby having his old Motherease ones. But then came a UK-wide lack of itti bitti boos! A very helpful retailer, Miranda at Twinkle Twinkle, who had one bitti boo left in stock to send me, then tried to chase the company several times over several months for me, but all to no avail – they just couldn’t say when the new batch would arrive in the UK (they are an Australian make). Eventually, the weekend before this one just gone, I decided I’d have to give up on that plan, and look elsewhere. This is the main reason why it’s taken me until now to make some decisions, and in a way I’m glad of the wait, because our needs are now changing with Andrew wetting less in the nappy and pottying more – we probably don’t need to buy much toddler nappy (daytime) gear, but rather concentrate on a few more bits for baby and some cloth night nappies. Where did I do my research to help me come to decisions on stash expansion? My first port of call has been a few sites that have general info on cloth nappies as well as lots of reviews by mums (and dads, though usually mums) who, along with their little ones of course, have tried and tested the amazing array of nappies on the market. I particularly like clothnappy.info, which also has a Facebook page where I’ve asked questions, and clothnappytree.com, which has a great forum where I’ve asked questions. Once I had my eye on a few different brands and models that looked promising, I then kept checking out some sites that sell pre-loved nappies, in case I could spot any bargains of the ones I was looking for. I particularly like Gumtree, which is local so you avoid postage costs, usednappies.co.uk, preloved.co.uk and the classified ads section on the clothnappytree website. Unfortunately I haven’t yet come across any that I’m looking for that haven’t already been snapped up – you have to move fast in this dog-eat-dog world of pre-loved fluff! But I live in hope that one day I might pick up the odd bargain or two by keeping an eye out when (if) I get chance to look at pre-loved sites. 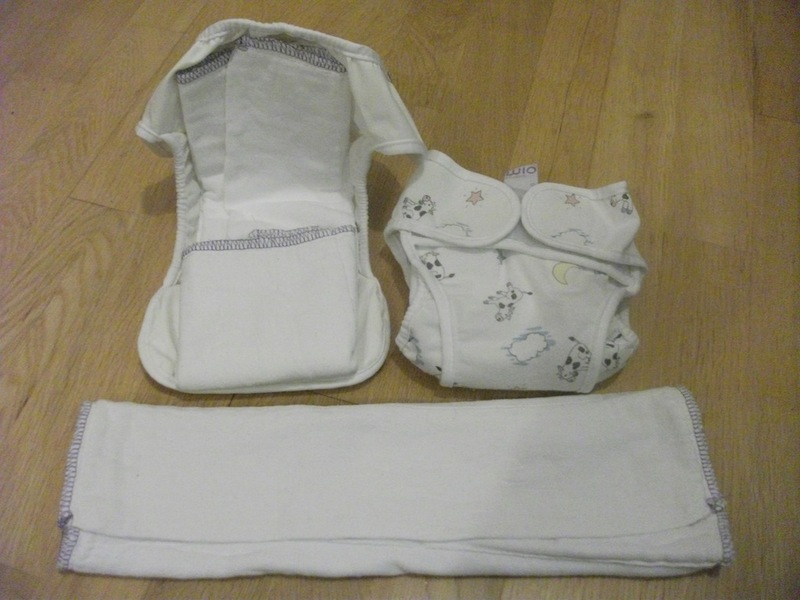 Fitted – These are what we already have (Motherease); they are a piece of towelling material shaped like a dispy nappy, with some form of fastening e.g. 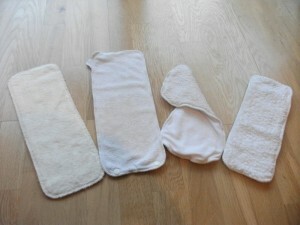 poppers, and also need a separate waterproof cover or ‘wrap’; they usually have a staydry inside layer and the absorbent layers are sewn into the core (the middle strip) of the nappy. 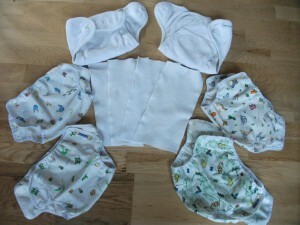 Flat/Pre-fold – These, like the fitteds, are also a two-part nappy system; they have a square piece of fabric, similar in texture to a muslin but with many layers sewn together, which you fold into a rectangular shape that fits into the crotch and is held in place by a separate waterproof wrap (rather than any form of fastening like the fitteds). 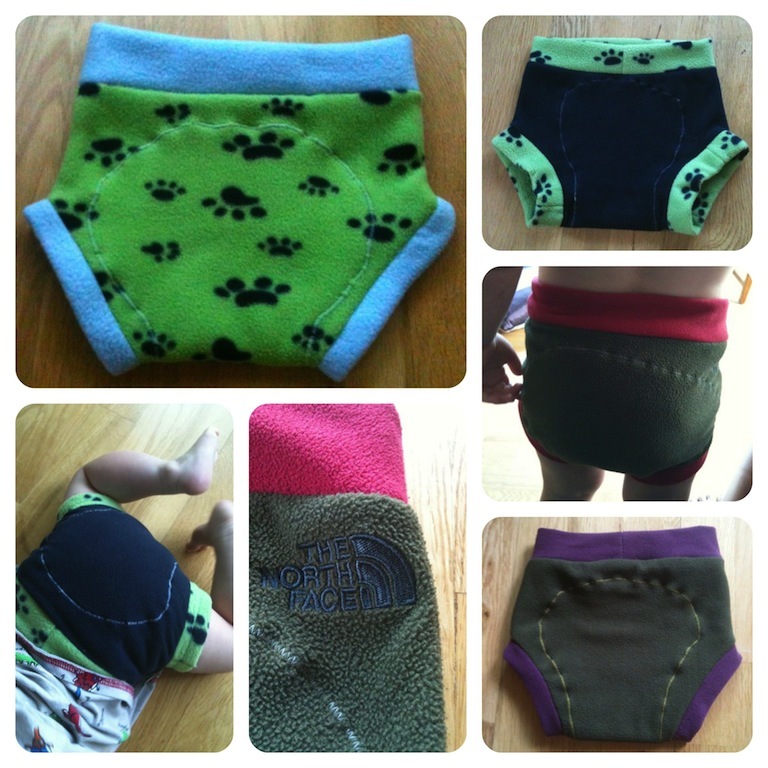 All-in-one (or ‘AIO’) – These, unlike the fitteds and pre-folds, are a one-part nappy system; they have a waterproof outside layer, a staydry inside layer, and absorbent inserts are sewn in between the two, so you can’t take the nappy apart at all – this is very convenient for changing (like a dispy it only has one layer of fastening to do) but it takes longer to dry than a separable nappy. 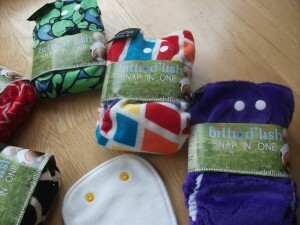 All-in-two (or ‘AI2’) – These are a compromise between an AIO and fitteds/flats; they have a waterproof outside layer (the shell) and a snap-in inside layer, which can be separated for washing and therefore drying faster than an AIO, but poppered back together when dry so that there’s only one layer of fastening to do when changing (like an AIO). 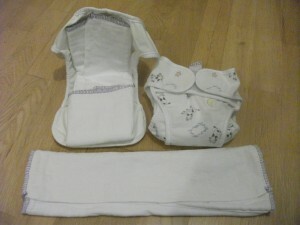 Pocket – These are also a compromise between an AIO and fitteds/flats; they have a waterproof outside layer, a staydry inside layer and in between the two is a pocket into which you can place absorbent inserts, as many or as few to suit the amount that the child wets; you separate the nappy and inserts for washing and (therefore fast) drying, and put it back together when dry, ready for the nappy change during which there is only one layer of fastening to do. ….you can add boosters inside the main bit of the nappy (or inside the pocket with pocket nappies) if the absorbency of the nappy alone isn’t enough for how much the child wees. …. they usually come in two size options: either ‘sized’, which means you buy small, medium, large etc. as the baby grows, or ‘one-size’ (‘birth-to-potty’ or BTP) which should fit a newborn as well as a toddler, normally involving some folding or poppering to change the size. My first acquisition was actually a few weeks ago when I went to our local NCT nearly new sale, on the lookout for a starter set for my brother and his partner to use with my niece. I found a bargain bag of 36 Bambino Mio pre-folds and 6/7 wraps in each of three sizes (newborn, small, medium – which should last her upto about a year old, if they like them). The price was so cheap that it seemed silly to them not to buy it, even if they didn’t end up liking cloth or those nappies in particular, and that’s what I thought too. But as they are wisely waiting a little while before trying cloth, just like we did as life is challenging with the addition of a first baby, I asked if they wouldn’t mind me keeping some of the newborn wraps and some pre-folds, so that our newborn could get some wear out of the smallest wraps that my niece may well have grown out of by the time they start using the nappies. In return I gave them a few of our Motherease to try as well as their pre-folds, so that their initial experience of cloth isn’t just based on one type of nappy. 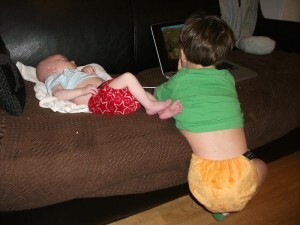 [Correction: they have in fact started using the cloth nappies already, which is great!] 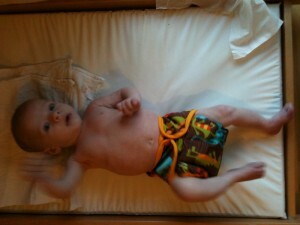 I’m curious to see how these pre-folds compare with our fitted nappies. 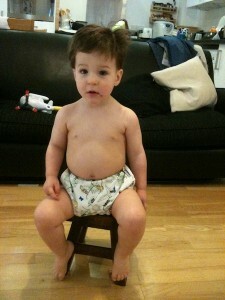 For a start, they look far less bulky than the Motherease for a small baby. As these pre-folds were more of a swap than an acquisition, that doesn’t increase the number of nappies in our stash much, but it does increase our variety. If my niece and/or her parents don’t get on with them, and if we do, then maybe they might like to swap some more Motherease for some pre-folds. Bambino mios – bottom shows folded flat nappy, top left shows pre-folded nappy in wrap, top right shows wrap done up with nappy inside; all ready for use when we have a bum small enough to fit in them! 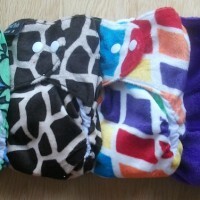 Although the itti bitti boos were nowhere to be seen this summer, I do love the one we have, because it’s such a lovely slim fit and is gorgeously soft, but is also extremely absorbent; this seems to be the design of all types of itti bitti nappies in general. So I decided to order a couple of each size (small, medium, large) of the itti bitti d’lish(snap-in-one or all-in-two (AI2) design) for use in the daytime with baby and Andrew – especially for when we go out, as I’ll only have one layer of fastening to do rather than the two that I currently have with our separate fitted nappies and wraps, to save time in nappy change rooms which are sometimes challenging enough with one baby let alone a toddler and a baby. Our 6 new itti bitti d’lish: 2 small (top), 2 medium (middle), 2 large (bottom); also showing an extra snap in booster set, which can replace a wet one and the main nappy shell be used again. 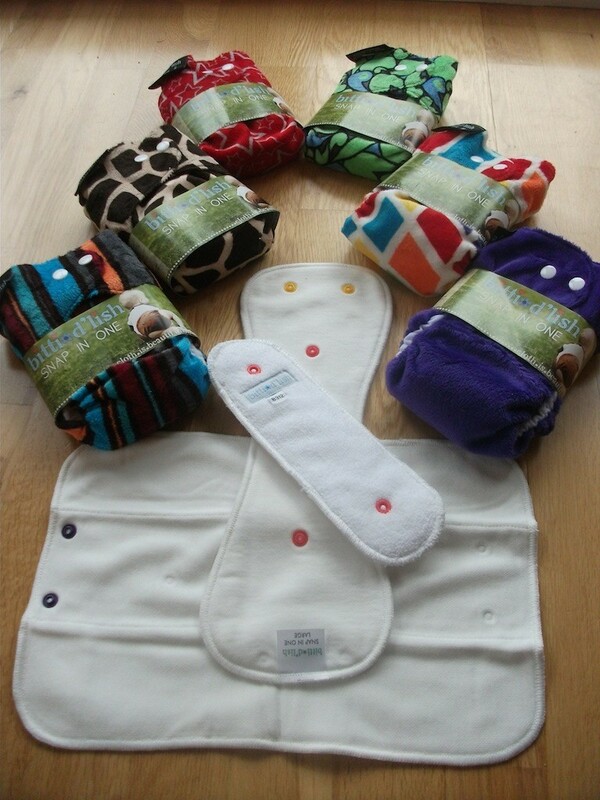 I was recommended, by a few friends as well as online forums, Fuzzibunz nappies– they are pocket nappies which can be stuffed with various amounts of boosters to suit daytime or night-time use. They come as either a sized nappy or a one-size which adjusts with poppers to fit different ages. I went for a couple of one-size Fuzzibunz, to try out on both Andrew and baby, both in the day and at night, and see what works best. Online I was recommended Minki pocket nappies for overnight use with a toddler, as apparently they are ‘bombproof’ (!) when you add lots of boosters. The great thing is you can also use them as trainer pants for a toddler if you don’t add boostage. This seems like a good thing to try on Andrew now, as we can adjust the absorbency to fit with how he’s going with the potty, so I’ve ordered a couple for now. They haven’t arrived yet, so there’s no photo here. Finally, I added some little lamb bamboo boosters to one of my orders, which will be a useful addition to our stash of boosters, so that we can stuff them into pockets for extra absorbency overnight. These are supposed to be one of the most absorbent boosters you can get! Where did I buy from? There are so many websites out there selling cloth nappies, that it took me quite a while to trawl through them all and compare prices. I have to say there isn’t much in it really, unless you find a sale on somewhere or a special offer. I often wish that I could just visit a shop that sold all the different types and buy them there and then instead of waiting for orders to be processed and delivered, even though it doesn’t really take that long (unless there are stock issues like the itti bitti boos!) Call me old fashioned, but there’s just something about the shopping experience that isn’t the same online. Tom often jokes that I should set up a cloth nappy shop in Cambridge – I actually reckon there might be a market for it, but I’m not sure I’m really business-woman enough to give it a go. In the end, my favourite sites for shopping at were Twinkle Twinkle (because the owner Miranda has been very helpful in the whole boo saga), fill-your-pants.com (mainly because of the name, but also as they do free UK delivery for all orders), and The Clean Green Nappy Machine (because they actually have a real shop, but unfortunately it’s up North, too far to go even for cloth nappies otherwise I’d be there like a shot, and because they do discounts if you buy a lot in one go). 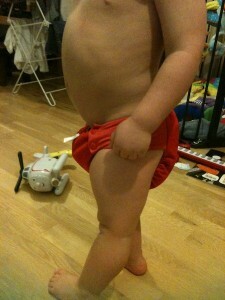 So that brings us to the end of my thoughts on nappies for this week. You can probably tell that I’m very enthusiastic about this! 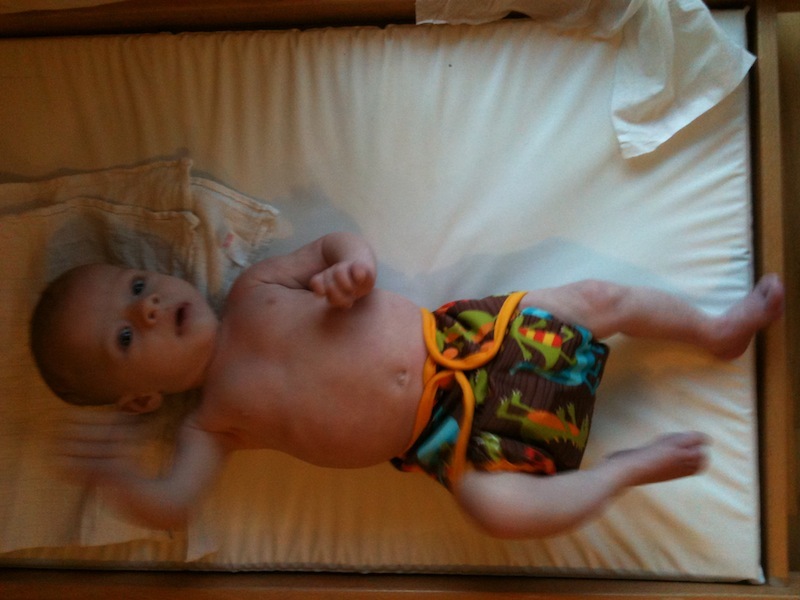 I hope what I’ve written is helpful and interesting for anyone considering cloth nappies, or even those who are using them already, or even those who have no need to use nappies (these last people probably haven’t read all the way down here I’m guessing!) I’d love to read your comments if this was useful to you.